1.75 oz. of Sagamore Rye. .5 oz. of Tamarind Syrup. .5 oz. of Lemon Juice. .75 oz. of Cilantro Ginger Shrub. Top with fever tree club soda. Add the ingredients listed above except for the club soda to a shaker. Shake and strain into a Collins Glass. Garnish with with Lemon peel and fresh Cilantro. De-shell a dozen Tamarindo bean pods. Simmer in 4 cups of water for 45 minutes or until Tamarindo dissolves completely into water. Strain liquid through a chinois and coffee filter. Add 4 cups of sugar, stir until sugar is dissolved. Allow to cool and enjoy. Peel fresh Ginger (about 2 cups worth) and mince in a blender. Take ginger and finely chopped stalk of Cilantro and add it to 4 cups of Apple Cider Vinegar in a sealed non reactive container. Allow to rest in cool place for 3 days. Add 4 cups of sugar, stir until it dissolves. Ouzo Bay is located in Harbor East, which is a great little area of shops, restaurants and hotels. Ouzo Bay specializes in Greek Cuisine and an assortment of Signature Cocktails that should suit everyone’s taste. They go that extra mile by serving you an after dinner cocktail, Ouzo of course. William Escalante is the head bartender at Ouzo Bay and obviously enjoys his trade by adding a little flair to his service. This is not the first time we have seen Will behind the bar, he has participated in a wonderful event for Cystic Fibrosis. Rye’s Up Against Cystic Fibrosis. This event has some of the finest bartenders in Baltimore, so you are pretty much guaranteed a great cocktail from William. This year William won “Judge’s Choice at the 2015 Rye’s Up Against Cystic Fibrosis”. This Signature Cocktail is a refreshing glorified whiskey highball. Perfect for your summer cookouts. If you live in horse country like I do, perfect for the horse races. 1. 5 oz. of Uncle Val’s Botanical Gin. .5 oz. of Fennel Syrup. .5 oz. of Fresh Lime Juice. 1. oz. of Fresh Watermelon Juice. .5 oz. of Yellow Chartreuse. Garnish with Lime Peel and Cantaloupe Wedge. Add ice to Coupe Glass and set aside to chill. Add ingredients to shaker in order listed above except Lime Peel and Cantaloupe. Empty ice from Coupe Glass. Shake ingredients and strain into Coupe Glass. Run Lime peel around glass rim, then add as garnish. Garnish glass with Cantaloupe wedge. 2 tablespoons of Fennel seeds, toast them briefly in oven. Then simmer in 4 cups of water for 20-25 minutes. Strain fennel seeds, add 4 cups of sugar. Stir the sugar until it dissolves. This Signature Cocktail has honeyed notes and herbal flavor. These flavors arrive from the blending of Uncle Val’s Gin, Yellow Chartreuse, fennel, lime and watermellon. This makes for a light and refreshing summer cocktail. 2 oz. of Papa’s Pilar Blonde. .75 oz. of Orgeat Syrup. .75 oz. of Passion Fruit Purée. Pineapple Wedge and edible Orchid Garnish. Place all ingredients in shaker. Shake and strain into Collins Glass. Garnish with edible Orchid and Pineapple Wedge. 250 grams of Toasted Almonds slices. 1 oz. of Orange Flower Water. 2 oz. of Amaretto Disaronno. Add the Almonds and lower water temperature to a simmer. Allow to simmer for 25 to 30 minutes. Strain Almonds and add sugar. Add the Orange Flower Water, Cognac and Amaretto. Stir and allow to cool. William Escalante is the head bartender at Ouzo Bay and obviously enjoys his trade by adding a little flair to his service. This is not the first time we have seen Will behind the bar, he has participated in a wonderful event for Cystic Fibrosis. Rye’s Up Against Cystic Fibrosis. This event has some of the finest bartenders in Baltimore, so you are pretty much guaranteed a great cocktail from William. This year William won Best Cocktail with this cocktail at Rye’s Up Against Cystic Fibrosis. 1.5 oz. Papas Pilar 24 yr. Solera Aged Rum. 2 dashes of Regan’s Orange Bitters. Add ingredients listed in order listed. Stir and strain into a tumbler with ice sphere (optional) regular ice is fine. “Flight of Icarus” from Ouzo Bay which is located in Harbor East, which is a great little area of shops, restaurants and hotels. Ouzo Bay specializes in Greek Cuisine and an assortment of Signature Cocktails that should suit everyone’s taste. They go that extra mile by serving you an after dinner cocktail, Ouzo of course. This has Signature Cocktail has flavor notes of Vanilla, Butterscotch, Toffee, Caramel, and Dark Chocolate. with the blends of Papa’s Pilar 24 yr. Solera Aged Rum, which has notes of vanilla, cinnamon, dark Italian roast coffee and honey, with hints of sherry and port. The Regan’s Orange Bitters bring in the aroma of fresh orange peel twisted right over the drink. The sweetness of Agave combined with the Averna Amaro liqueurs smooth rich flavors of vanilla, apricot and dark chocolate. All of these flavors combined form a very well rounded complex flavorful drink. “Flight of Icarus” is well worth the trip to Ouzo Bay. .75 oz. of Cinnamon/Clove Syrup. .75 oz. Fresh Pineapple Juice. 1.5 oz. Buffalo Trace Bourbon. Splash of Fever Tree Club Soda. Cinnamon/Clove Syrup – Bring 8 cups of water, 10 cinnamon sticks and a tablespoon of whole cloves (grinded) to almost a boil and allow to simmer for 25 minutes. Then strain cinnamon sticks and cloves and add 8 cups of sugar to complete syrup. Add the ingredients in the order listed above to a shaker with ice. Strain into Collins glass with ice. This Signature Cocktail from Ouzo Bay is seasonal a blend of cinnamon, clove, pineapple, vanilla and lemon flavors. .75 oz. of Bacon infused Maple Syrup. 2 oz. of Bacon Infused George Dickel Rye Whisky. Set ice in Coupe glass to chill the glass. Add the ingredients listed above to a mixing glass, if you do not have one a pint glass will suffice. Add ice to the ingredients and stir using a bar spoon. Empty ice from Coupe Glass and double strain cocktail into the glass. Then garnish the Nutmeg Orange Espuma with Bacon Powder and Grated Nutmeg. Side Note: To make the Bacon Powder/Grated Nutmeg mix one cup of Bacon fat with maltodextrin to make the Bacon Powder. Then place equal parts of Bacon Powder and grated Nutmeg into a shaker. Espuma: 800 ml of the Milk, 4 Egg Yolks, 50 gm of Sugar, 1.5 oz. of the Bacon Infused Whiskey, Zest of half an Orange, Grate one whole Nutmeg, 4 gm of Xantham gum, 3 gm of versa whip. Cook the bacon in a skillet until crisp. Deglaze the pan with the water and maple syrup and reduce until two cups remain. Strain and dispose of bacon and return syrup to a small saucepan. Whisk over high heat for 3-4 minutes, until syrup thickens. Allow the syrup to cool, to prevent the fat from separating whisk occasionally. Refrigerate to make syrup thicker. When ready to use bring to room temperature. Bacon Infused George Dickel Whisky: Ingredients 750 ml bottle of Whiskey, a couple of jars, 3 to 4 pieces of bacon, coffee filters and a funnel. Process: Cook the bacon until crisp and retain the fat. When the bacon has cooled a bit pour 1 ounce of fat from the pan. Pour the whiskey into a jar or any container. Strain bacon fat into said container and infuse for 4-6 hours at room temperature. Place mixture in freezer until the fat is solidified, Using a funnel and coffee filters pour bacon whiskey to catch fat. Change the filters when necessary, after this complete the filtering one more time for clearness. This cocktail is a fine balance of bacon, rye, maple, nutmeg and orange flavors. .75 oz. Mint Infused Demerara Syrup. .75 oz. Fresh Lemon Juice. 2 Dashes of Angostura Bitters. 2 oz. of Buffalo Trace Bourbon. Add all of the ingredients up to shaker. Add ice to shaker and shake. Add ice to High Ball glass. Garnish with the dashes of Angostura Bitters and Mint Sprig. 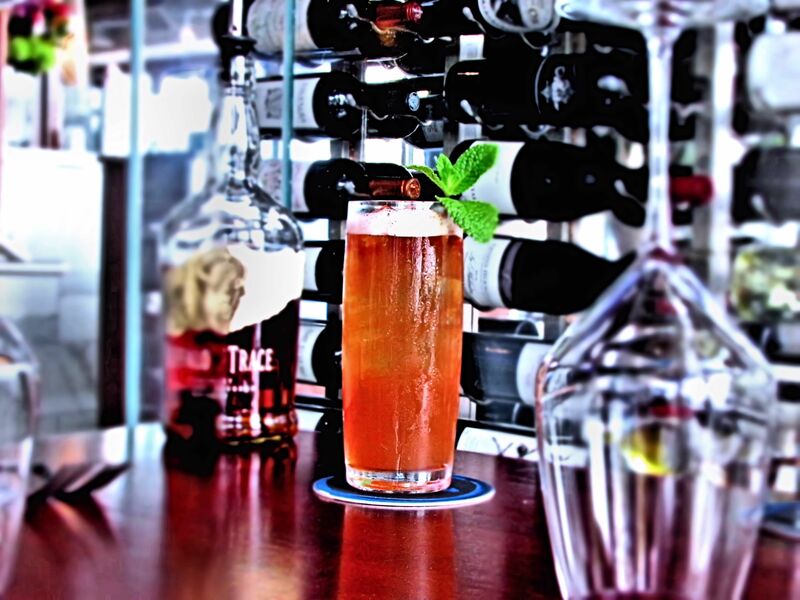 Side Note: How to make Mint Infused Demerara Syrup. Equal parts Demerara Sugar and water, bring to boil and add fresh mint. Let it steep for 2 hours, strain mint. Enjoy! This cocktail can best be described as a blend of seasonal flavors, where mint, caramel apple, and vanilla prevail. I would have to say this is a great Fall cocktail. William Escalante is the head bartender at Ouzo Bay and obviously enjoys his trade by adding a little flair to his service. This is not the first time we have seen Will behind the bar, he has participated in a wonderful event for Cystic Fibrosis. Rye’s Up Against Cystic Fibrosis. This event has some of the finest bartenders in Baltimore, so you are pretty much guaranteed a great cocktail from William.